Here’s a fun Vine video sent in by Kitty and Chris of their cat Deanna playing with her Cat Faeries carrot catnip toy! Your cat will sleep absolutely any place they wish. They look for places which are soft and warm, comfortable and in a safe place. And a safe place can be on a high surface like your bed or a dresser, or on the floor nestled in a pile of clothes. But those places get moved according to your whim, and they are washed or cleaned frequently. Most cats like a cat bed because they can arrange it to their liking and also that their fur clings to the fibers of a cat bed and their scent both of which are soothing to your cat – much like snuggling into their mother’s tummy to nurse and sleep. 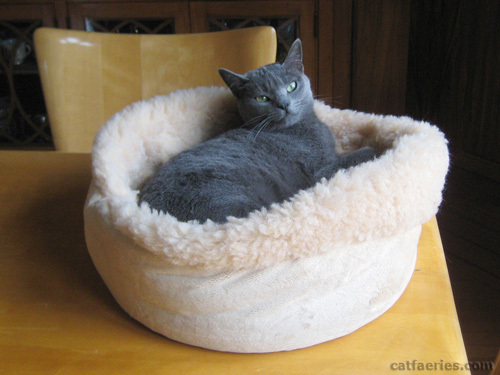 Yes, you will want to wash your Cat Faeries cat beds from time to time! We give you the instructions with your order. Don’t worry if all of the cat fur doesn’t wash out – kitty prefers it that way! Adult cats tend to sleep 15 to 17 hours and in intervals during a 24 hour period. Some cats, particularly elderly cats and kittens, can sleep 20 hours a day. All cat lovers joke about this, and wonder – why do they sleep so much? Is it that our modern housecats are overly pampered, perhaps even lazy? Not at all! They are sleeping to conserve their energy. All cats, including the big cats, are predators and they are hardwired to leap into action, to chase their prey (or toys) and hunt for suitable food which is what they do mainly at night (which is why they see so well in darkness). Cats are the most active at twilight: dusk and dawn, which is when prey animals such as rodents, birds, and bugs are the most active. Therefore a lot of sleep is required even if the ability to spring into action from sleeping isn’t necessary for survival. Cats spend so many hours sleeping to store energy reserves and allow their bodies to detox and stay strong for the hunt, even if it’s to stalk a catnip toy. Unlike most humans cats have the ability to spring into action from a light or deep sleep. Hunting takes a massive amount of energy and the best way to nurture energy is through sleep or rest. A dozing cat is conserving energy for future activities. We’ve heard cats referred to as being nocturnal, but that’s incorrect, they are crepuscular. These are animals that are active during the twilight hours of dusk and dawn when they seek out food and water. Our modern housecats do best with being fed two meals a day, one in the morning and the other in the evening. Cats aren’t the only crepuscular animals: dogs, nighthawks, moose, rabbits, ferrets, hamsters, guinea pigs, bears, ocelots, deer, moose, squirrels, mice, rats, chinchillas, skunks, wombats, wallabies, possums, spotted hyenas, bobcats, and mosquitoes. 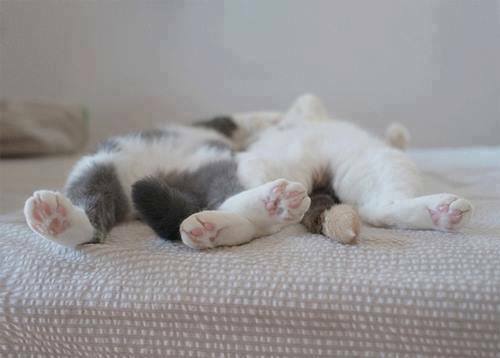 1)	Cats being very individual creatures often develop their own sleep patterns, this is normal. Sometimes they mimic our sleep patterns. If you notice a change in your cat’s sleep pattern this could be a sign of illness, especially for older cats. Call your veterinarian. 3)	Yes, they do dream! And they do have an REM (rapid eye movement) and non-REM phases just like we do. Don’t you love it when you cat appears to be dreaming of running through a field and moving their mouth like they are chewing, or chomping on a plump bird? Cat Toys! Tiz the Season to delight all of the cats in your life! 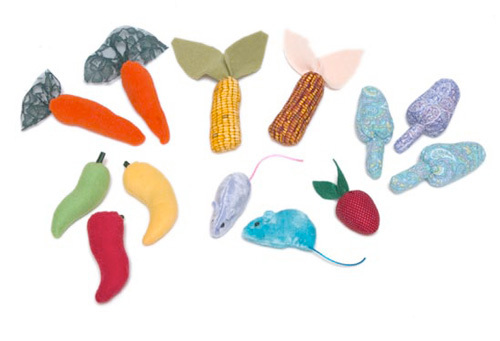 Cats love our unique cat toys and this is a great time of year to get more. Going to holiday gatherings at the home of other cat lovers? Cat toys make the best hostess gifts! 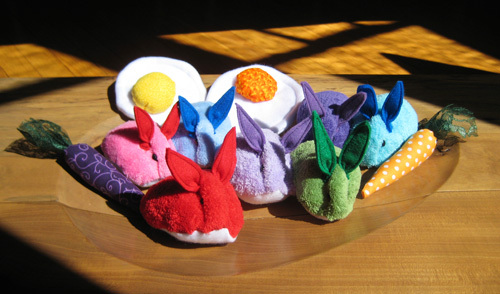 My cat has new friends in 4 of your catnip bunnies! We love the shape, the soft fabric, and the colors. 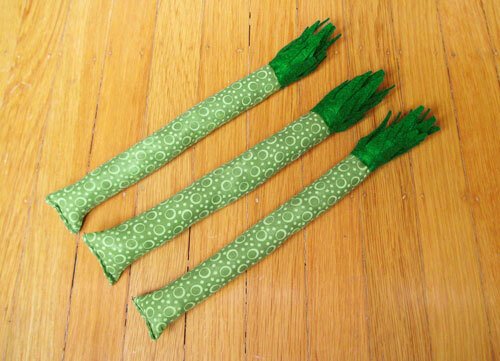 Please send Maverick a toy such as the pickle or the pepper as he loves the “long” toys and already has the asparagus. This is for his birthday next week and he’s recovering from the removal of a mast cell tumor. Thanks!! 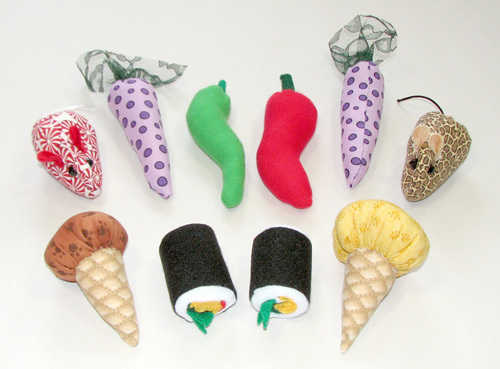 Already have pickle, corn cob, and pine cone toys. Would like something different if possible such as; carrot, chili pepper, fried egg and ice cream cone. Thank you. I am looking for more ears of corn – my cat who was very sick but doing okay now, sleeps with it as his pillow, carries around and would be lost without it. No other designs work! When it comes to catnip toys my kitties would prefer the following if you have available: mushroom, chicken bone, ice cream cone (chocolate w/sprinkles if avail. ), pickle. Our cat Franklin just lost his littermate of 12 years, and is doing very well… but he needs some new toys to give him some fun now that he’s a solo kitty. He’s a big boy, and loves his CF pear. Something large like that (ice cream cone?) would be great, along with a mouse or 2 (he likes to swing it up in the air by the tail). Thanks! My cat only likes mice. Please send only mice. My cats would love if there’s a strawberry in the gift set. Thanks! Have you heard this before? Your cat toys are the only cat toys our cats will play with! Without a doubt, setting up your own kitty cam to document the experiences of your young kitten’s playful life can be an incredibly rewarding experience. Those early moments of development which we all cherish – the innocent pounces and the adorable snuggles are unforgettable. A kitty cam is a relatively inexpensive way that allows you to catch these precious and funny moments on film. Though the project itself is monetizable, setting up and executing a successful kitty cam project can take an arduous amount of effort and time. For those who love their kittens and want to share the adorable moments of their young felines’ lives, however, the investment of energy into a kitty cam project is well worth it. Though there has been a notable resurgence in popularity for live-streaming videos of cute animals and their babies within the last five years, the idea of the Crittercam is something that has been in existence since the 1980s. But the origins are not necessarily with regards to observing the adorable, but to further the abilities of scientific zoology research. In fact, Greg Marshall of The National Geographic invented the Crittercam to observe sharks (arguably, not the cutest of animals) without disturbing their behavior or habitat. Today, National Geographic is working on a Kitty Cam Project, in line with the popular trend, but of course their work with the medium is scientific: they aim to understanding the movement and behaviors of free-roaming domestic animals. Today, it is popular for animal shelters, pet stores, and cat lovers to set up kitty cams that watch their precious pets throughout the day – and viewers around the world take comfort in being able to remotely watch the kittens grow and play. Without question, a popular kitty cam can become a means for earning extra cash. With many monetizing options available for both YouTube videos as well as streaming live feeds, many pet owners have taken advantage of the medium in order to help defray some of the costs of ensuring that their kitten is happy and healthy. After all, the price of vaccinations, monthly flea medicines, and high-quality, nutritional cat food can add up quickly over the first months of a young kitten’s life. Monetizing can be relatively simple, by sharing videos on YouTube and allowing for advertisements to show along the bottom edge of your video. However, for this particular tactic to work, you will have to employ a social media campaign in order to generate the viewership needed to actually make a financial return on your investment of time and money. Though it can be a joy to share the life of your young kitten with the world through the live stream medium, amassing the thousands of followers and viewers needed through platforms such as Facebook, Twitter, and Instagram takes a consistent effort and a moderate level of expertise. Especially since there is a lot of competition in the kitty cam market – including videos from the “giants” in the zoology industry such as Animal Planet and the World Wildlife Fund – take the time to find out how your kitty cam will fill a particular niche, and be sure to take the time to market your videos through many social media venues. This is an article by Ashley Williamson. Ashley is a freelance writer and an occasional guest-blogger and a full time pet lover from Wisconsin. When she is not working she likes to travel and read as much as she can. Cat Faeries is delighted to have Ashley as a guest writer. Generally cats are excellent at hacking up something that they might have swallowed. But sometimes the object or piece of food gets stuck in the throat and this can cause the cat’s airway to shut down and lead to death. This illustrated step-by-step how-to will show you how to properly dislodge the object. You’ll be surprised that some of the techniques you might think will work, really don’t work and can cause more problems. While you are trying to dislodge the object put a call into the vet’s office saying that you are probably coming in either for the cat to be looked after the object comes out or if you can’t get it out.